Lots of clocks for your cash. Slightly slouchy performance at lower speeds is a little off putting. Down at the cheaper end of the dual-channel performance memory market, it's extremely crowded. Unlike high-end memory kits, the development budget doesn't stretch to fancy frills. Flashing LEDs, sleek and slender cooling fins and clip-on coolers are not part of the equation sub-£100. Standing out from the crowd is therefore that much trickier. The A-Data Extreme 2,000MHz's answer is to give you more of what really matters. Granted, the basic 4GB dual-channel configuration is ordinary enough, as are the plain silver heat spreaders and the standard voltage range of 1.6 to 1.8v. Even the packaging drives the message home. Nothing short of a chainsaw will extricate these DIMMs from the gruesome plastic blisters. What you do get, however, is frequency by the boatload. These DIMMs are rated at 2,000MHz. On paper, that's a healthy 400MHz boost compared with the otherwise similar OCZ Platinum 1,600MHz, another 4GB dual-channel DDR3 kit. The added frequency specification of the A-Data Extreme 2,000MHz is just as well given that performance at our default 1,333MHz frequency is relatively mediocre. The margins are admittedly small when it comes to memory testing. But there's no doubting the Extreme brings up the rear in most of our benchmarks when running at 1,333MHz. The explanation is probably the slightly pedestrian 9-9-9 timings. At this sub-£100 price point, something has to give in order to deliver that impressive headline frequency and latencies are a relative weakness. That said, crank up the clocks and volts and the news improves. This kit is rock solid at the advertised 2,000MHz frequency. At that speed, it turns the tables on the OCZ Platinum 1,600MHz kit, edging it in most of our benchmarks. Even better, 2,133MHz is also possible with few signs of latency or timing-related issues. Indeed, bandwidth climbs to well over 25GBps, which is extremely impressive for a dual-channel setup. In fact, at that frequency, AData Extreme 2,000MHz churns out 65 frames per second in the crucial World in Conflict gaming benchmark. That makes this kit a match for the much more expensive Corsair Dominator GT dual-channel kit. More importantly, that's around 10 per cent faster than a typical dual-channel DDR3 kit running at the default 1,333MHz setting. 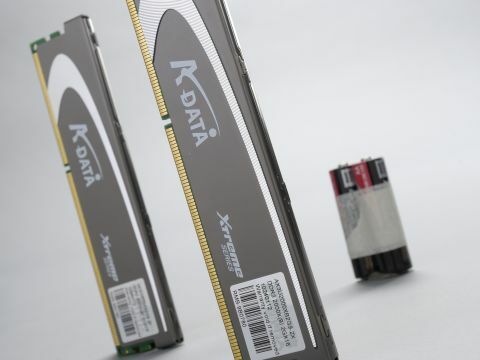 With that in mind, the fact that Adata has specified only heat spreaders for cooling, rather than a more extensive solution is academic. This kit delivers at high frequencies.